Insulating an existing external wall has a double advantage. You can save on energy costs and your house will look like new again. Especially when you want to refurbish the house or replace the windows, you can consider external wall insulation. In this article, we are going to discuss the different procedures, costs and points of attention. Are you interested in external wall insulation? Request free and non-binding quotes here. In quite a number of renovation project, people choose to cover the external walls with insulation and stucco. This is a fast method that offers many advantages; a broadened foundation is needless. Have the windows already been installed? No problem at all! If you do not plan on carrying out the work yourself, this method is the cheapest solution. Advantages: Lightweight – quick execution & space-saving. Installing a new external wall may not always be evident. You will lose space and in most of the cases, a new foundation has to be cast. In order to solve this problem, manufacturers of stones and insulation have developed a system that has the look of bricks and the advantages of stucco or wall plaster. In order to give your house a natural look, you can also choose to work with a type of wood suited for outdoor use. 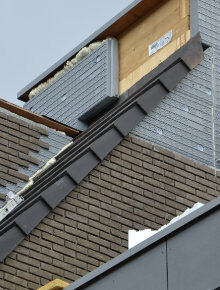 First of all, insulation boards are attached to the external wall. After that, one applies wooden slats to assemble the new facade. 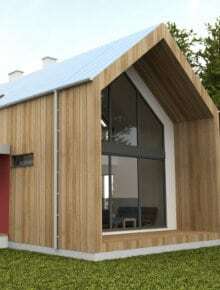 The air cavity between the exterior wall insulation and the timber cladding will avoid damp problems. 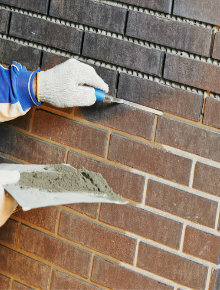 Do you prefer the sturdy and robust look of bricks? A new external wall can be built then. Since the insulation needs to be put in place first, an extra foundation is often made around the house. In order to save space and avoid thermal bridges, it is best to demolish the old facade as well. This method is only applied in the case of thorough renovations. Do you like a house with a modern and simple look? 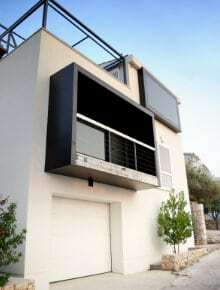 Then you may as well opt for aluminium facade cladding panels, sidings or rigid plastic sheets (such as Trespa). They are installed in the same way as wood, and they are available in an endless variety of colours, shapes and measures. These panels especially look good when they occur on rectangular houses. Do you want to insulate external walls? You can easily request and compare prices from professional insulation installers in your region. On this page, you can request quotes for free. When insulating the external walls, the thickness of the insulation material will play an important part in the ultimate energy consumption. As far as the walls are concerned, the thickness of the material does not matter. Around the windows, however, the amount of free space will be more limited. 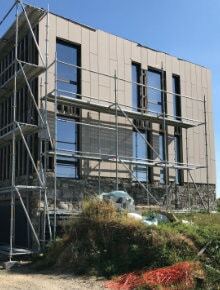 As the facade cladding should fit in with the windows as closely as possible, very thin insulation is often required. To solve this, the windows are often placed on the same line as the old external wall in the case of plastering the wall. Is this no option because you don’t want any changes inside of the house? It is a good idea then to install windows with an extra thick window profile or with an extra thickening. When you opt for a new external wall, the windows will have to be replaced and removed in any case. As a result of this, thermal bridges can no longer occur. If there is an air cavity in between of the internal and external wall, it will have to be filled with insulation. If you do not do this, the effect of the external insulation will be negated by the cold air circulation between both walls. When you remove the outer wall completely, you can ignore the air cavity. One can directly start applying insulation onto the internal walls.